It sounds rather nice, yes? The letters almost glisten as they jump off of the page. A poster, a picturesque postcard—Charm City is a marketing campaign that practically writes itself. Yet, this has not always been the case. If you were to step into a time machine and travel back to the Baltimore of days gone by, say, the early 20th century, and ask the same question—you might get a different, unanimous answer. Long before Baltimore was Charm City, it was the Monumental City. It has a certain gravitas—a reverence that its sparkling, present-day cousin does not. A perusal of The Baltimore Sun’s digital archive reveals when the switch took place, once and for all: the 1970s. 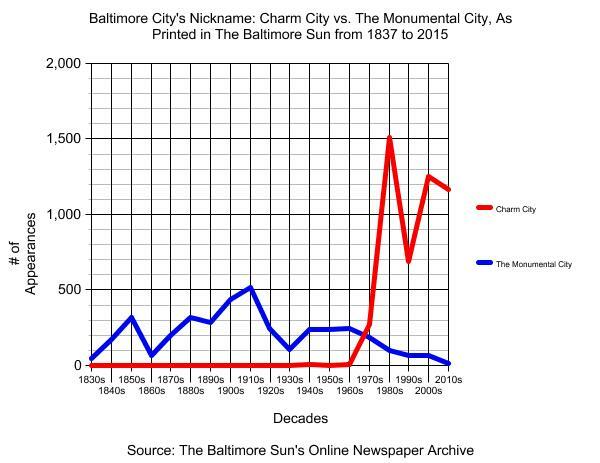 Which, honestly, is no surprise; when thinking of 1960s-era Baltimore, “charming” is hardly the first adjective that springs to mind… Or the second, or the third. The sixties were a time of great civil unrest, nationwide. Locally, those tensions came to a culmination with the race riots of 1968. And, as any Baltimoreans who lived through that time will recall, those were anything but charming. So, yes, while I do like the Charm City name, and modern Baltimore certainly does have a unique sense of charm—I prefer its older, more stately cousin. The Monumental City, that is a city for the ages! It bespeaks a community that has suffered great losses, and yet has also overcome them, conquering its foes along the way. The Monumental City is resilient. It will continue to stand, tall and proud, much like its weather-worn commander-in-chief, General Washington, aloft on his column in Mount Vernon Place. If you could, indeed, plan a visit to bygone Baltimore, Tuesday, October 16th 1827 would be an ideal place to start. That night, around thirty people gathered for a dinner which was, at least in part, to honor the memory of the recently-deceased Revolutionary War hero and Maryland Governor, John Eager Howard. Sitting between Major General Samuel Smith (on his left) and the Collector of the Port of Baltimore, James H. McCulloch (on his right), the President of the United States, John Quincy Adams, presided over what must have been a thrilling, patriotic scene. The room was packed with war veterans: members of the Maryland Society of the Cincinnati, undoubtedly bedecked in their glittering, L’Enfant, eagle badges, intermixing with soldiers who had been wounded at the Battle of North Point, when America was in the midst of its second war for independence. Adams—or JQA as I like to call him—had come to Baltimore on other business. His Philadelphia steamboat had docked at the basin’s wharf on October 14th, and he had immediately retired to Barnum’s Hotel, only to be informed upon his awakening the next morning that Col. Howard had passed away. The family, of course, wished for the President to attend the funeral, and Adams obliged. On October 15th, the city turned out in full “military array” for the funeral procession. The mood must have been somber and melancholy, but beneath the sadness on the faces of the Baltimoreans who lined the streets for the entire circuit, there was probably a sense of pride. John Eager Howard was a genuine patriot, but more importantly, he was one of Baltimore’s own. Generally speaking, this was an exciting time in the city’s history, and Howard was a big part of that. Just seven-and-a-half months prior, he had met with other local, prominent citizens at his country estate, Belvidere, just north of town to discuss the city’s plans for a brand new mode of transportation. Out of those talks came the charter for the Baltimore and Ohio Railway Company of Baltimore City, Maryland’s answer to Stockton & Darlington in England. In fact, given his role in its creation, Howard may well have been the city’s choice to lay the “first stone” at the commencement of the Railroad, on the 4th of July in 1828. That is, had he not died the previous October… Instead, Baltimoreans made do with a different, aged, Revolutionary-era patriot: Charles Carroll of Carrollton. Imagine the clinking of the silverware and glasses, the laughter of old stories among friends. And, finally, at the end of the night, the guest of honor, the president himself, rises to give a final toast: to “Baltimore, the Monumental City—may the days of her safety be as prosperous and happy as the days of her danger have been trying and triumphant!” How awe-inspiring that must have been! Baltimore City was justly proud of its presidential seal of approval, and it still is. A quick Google search of “John Quincy Adams + Monumental City” fetches about 240,000 results. Many of those links lead directly to official government websites, and well-respected, area media outlets. They all seem to be in agreement with one another, that JQA is responsible for the “monumental” moniker. Yet, not surprisingly, none of them bother to include a source to back up that claim. The link that presents the strongest and most compelling case leads to an article that was written by a Baltimore-based author and historian, Christopher T. George. In it, George points out that Adams was alluding to the three monuments that he had seen on his visit. The first two are the usual suspects: the Washington Monument (which was still in its construction phase), and the Battle Monument (which had just recently been completed). The third, however, is the lesser-known Aquila Randall Monument, which Adams saw when he traveled out to North Point. Though he never gives a direct citation, complete with a page number, George comes the closest out of anyone to providing evidence that JQA was responsible for the Monumental City name. Does JQA Have a Rightful Claim? Whether stating it outright, or simply insinuating it, the popular opinion is that Adams was the first person to use it. In the absence of any explicit references proving the case one way or the other, I was determined to find out if he really was the originator that everyone seems to think that he was. The first question, of course, was simple: did he actually make that toast? Luckily, the kind folks at the Massachusetts Historical Society have digitized all of Adams’s personal diaries. Turns out that the man was quite a writer. There are 51 volumes in total, and they span the years from 1779 to 1848. Thanks to some chronological indexing, they are relatively easy to search, especially when the specific date is known. With that, I typed in my destination: October 16th 1827. In volume 37, which covers the years 1825 to 1828, on page 311, a little more than halfway down the page, I struck gold. The quote is there, verbatim no less. John Quincy Adams really did make that toast! Pretty cool. Now, for the second question: was there a reference that proved the nickname originated with Adams’s toast? Theoretically, if he was the first person to use it, the earliest references should have been in October of 1827, referring to both the dinner and the president. The next logical step was to search in a newspaper database. After an unrestricted search of GenealogyBank yielded the above result, I set my sights on finding the earliest reference in Maryland-based newspapers. 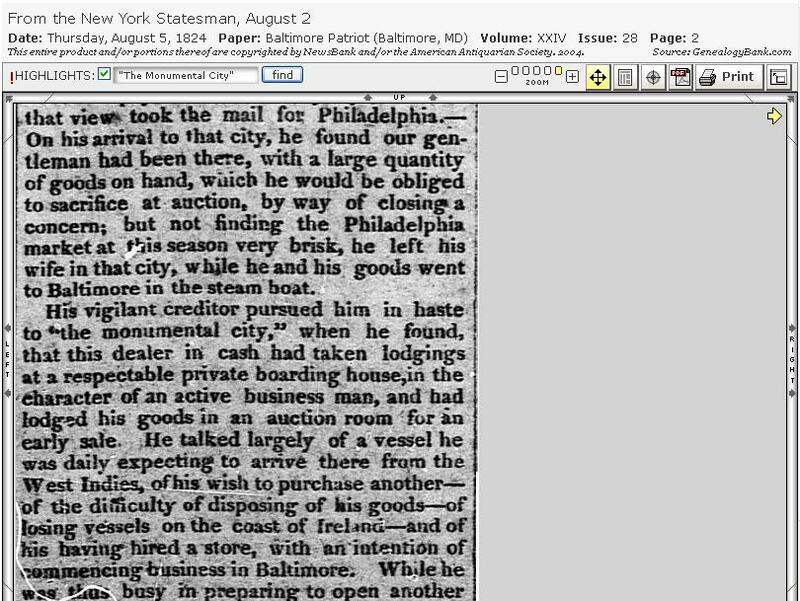 By restricting my search to the state of Maryland, I found the following article in the August 5th 1824 edition of the Baltimore Patriot… Although less humorous than its 1823 counterpart, it mentions the failed escape of a Baltimore-based con man by the name of E. Bourne, who evidently traveled up and down the east coast in 1824 with an intent to swindle wherever he went. Note that, while printed in Baltimore, the news that it was transmitting came from New York. 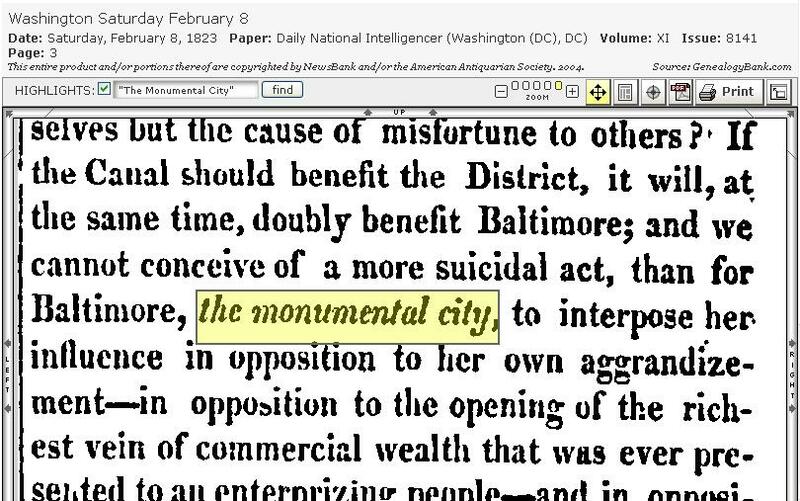 Thus, it was actually the New York paper which had called Baltimore “the monumental city.” This is important because it shows that the name had already entered the national lexicon. Therefore, I think we may well surmise that when JQA gave his toast in 1827, he was merely entrenching a term that he had already heard—sort of like the 19th-century version of creating a trending topic on Twitter. Adams was by no means the first to call Baltimore the Monumental City, but he is the one who took an already-existing nickname and made it famous. So, if Adams is not the originator, then where does the credit lie? Well, until someone finds a more conclusive answer, maybe it really is with JQA.